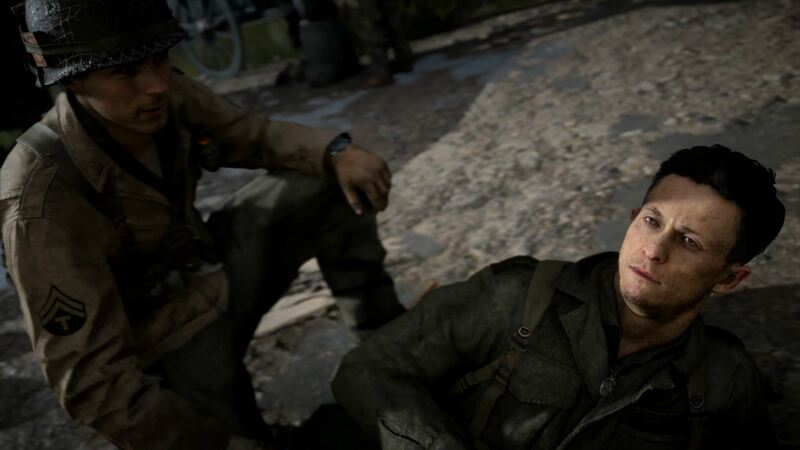 With the intro sequence hitting the beaches of Normandy, the cut-scene seamlessly transitions into gameplay and you’re suddenly there, on D-Day, 6th June 1944. The bombardment of bullets, bodies everywhere, the sea turning red with the blood of your fellow servicemen. You’ve got to make it up the beach to the trenches, with little more than a hope and prayer. This is World War II. From the offset this Call of Duty feels different. This isn’t your typical Hollywood blockbuster anymore. There’s not a lone protagonist fighting against a wicked arch nemesis. There are good guys and bad guys, in the sense of Allies vs Axis, but it’s not a comic book or a fairy tale: these are war stories. There’s a real sense of camaraderie throughout this title. You’re one of the men. You’ve got a team around you, and you’re going to have to work together to get through this – to hopefully liberate France and make your way to the Rhine to halt the German troops. Gone is the automatic self-healing of past iterations. You’ll need First Aid Kits to heal up, slowing down your pace and making you that bit more invested in the combat. It’s a smart move and you’ll need to be a little more conservative in combat as you can only carry up to four at a time, and they only renew roughly a third of your health each. Your squad mates will be on the lookout for kits and let you know when there’s some available. They’ll also do the same for ammo, grenades and air-support. Pierson, everyone’s favourite brooding sergeant, played by Josh Duhamel will even highlight enemies on the field for you with the spotting perk. WWII is quite a rifle heavy game, which is fantastic. There are a few LMGs dotted around, but you’re better off picking up a rifle and sniping off Nazi helmets. The M1 Garand with a Bayonet (yes, you can charge it into the enemy) is a beauty and the hit-boxes are quite forgiving, making it feel so satisfying to use. Not everything is smooth sailing, and there are a few Quick Time Events dispersed throughout the game, which is not really something we’d like to be seeing in 2017. QTEs can be annoying, especially when they’re a random key each time. There are also a couple of COD-esque slow motion headshot moments, though, which add drama and make up for the QTEs. Keep the combat on the trigger fingers, please. Saying that, this Call of Duty title isn’t entirely action focused. There are a few moments in where you genuinely feel a spark of emotion. This is a game that can tug on the heart strings. It’s not something COD is famous for, but it’s something I appreciated, especially given the subject matter. It’s worth stating that Sledgehammer has taken a mature approach to making a WWII game. This isn’t a “’MERICA, F YEAH!” game, this is a series of stories about a global horror that took place 70 years ago. They’ve treated the content with the respect it’s due. There are a few moments spread throughout the stories where you’ll get the chance to perform a heroic deed. This could be rescuing a fellow soldier from the grips of a Nazi, or dragging a wounded soldier to cover. You also get the opportunity to arrest prisoners or war, rather than gunning down enemy soldiers. These are all optional moral choices that can result in bonus points for you, or the death of a man. It’s pretty grim, but also a reminder that it’s wartime. The missions are short but sweet, and the entire campaign comes in at around six hours. It’s a top quality campaign that manages to pay homage to the contribution of our servicemen and women of the 20th century. As you work your way across the map, from North-Western France towards the Rhine there’s a real feeling of strategic importance to the actions you and your squad are taking. Even with a relatively short campaign mode, there’s enough diversity to keep you constantly entertained, including a dog-fighting scene, missions with mounted flak cannons taking down planes, tank-on-tank combat where you’ll operate a Sherman to destroy enemy Panzers, speeding jeeps in driving operations with mounted M1919s, and stealth missions with tidbits of actual intelligence – there’s one mission in particular where Nazi officers will ask you questions, in German, to check your story. It’s a good enough reason to make sure you’ve read the mission briefings. There are a lot of things to love about this game. The combat mechanics; The satisfaction of getting headshots with an M1, the mature story, and the depth to the characters within it. But one bugbear that can really grind your gears throughout the entire game is grenades. Credit where it’s due, there are nowhere near as many grenades as there are in some previous COD titles, but for some reason they always seem to pop out of nowhere in WWII. 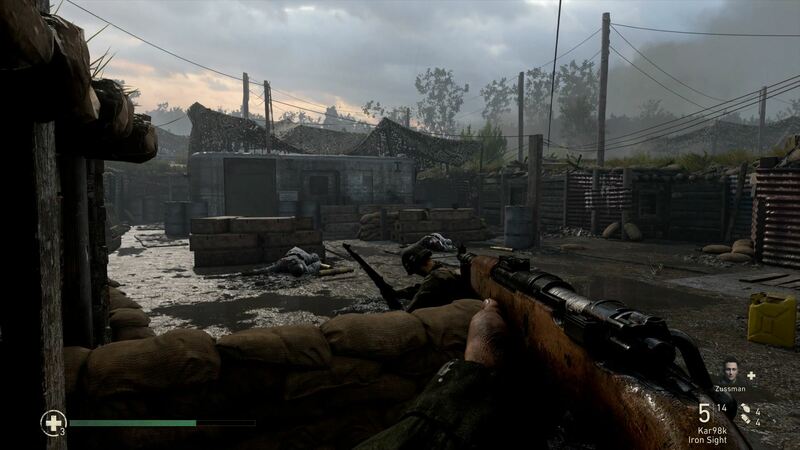 We’ve all spent many a COD running between cover locations to avoid pesky ‘nades, but in WWII there seemed to be a lot of dying from phantom nades that we either didn’t see coming, or were lost on the HUD due to excessive icons. We’ve got icons for Enemy Spotting from Pierson, First Aid Kids from Zussman, Targeting smokes from Aiello, Grenades from Stiles, Ammo from Turner, and somewhere among them we can only assume there was a grenade warning that got lost in the noise. It’s not a deal-breaker, but it’s one of those frustrations that has you pulling your hair out on occasion. Of course Call of Duty is all about the Multiplayer, and this year Sledgehammer has taken the refreshing approach of less is more. 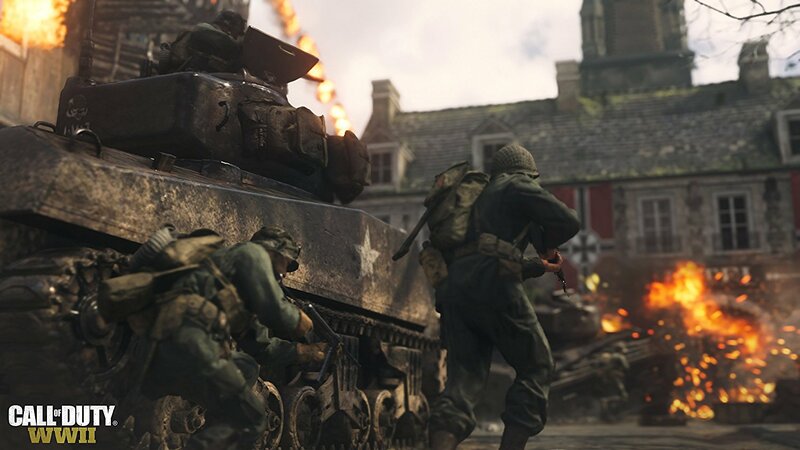 There are a few new introductions (in HQ and War), but for the most part WWII is a stripped-down multiplayer experience. Headquarters is essentially match lobbies 3.0. Gone are the days of waiting around on a lobby screen, tapping your foot until the match loads. In recent CODs we’ve had the ability to inspect gear, which provided some distraction, but now we’ve got a fully-fledged headquarters, which is a game world in and of itself. 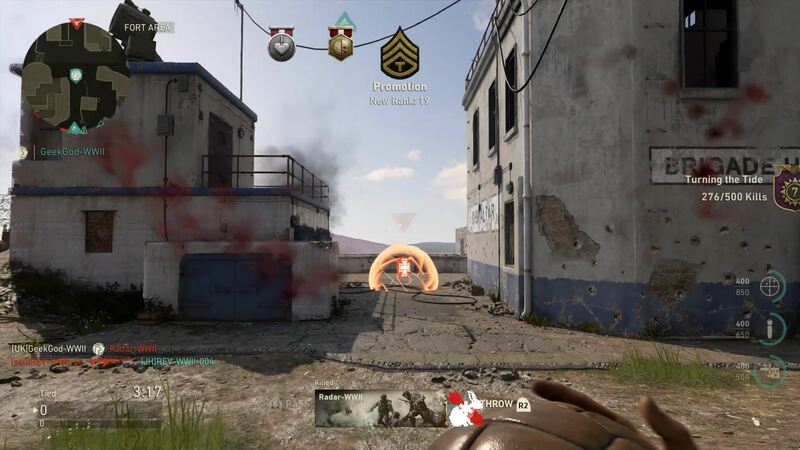 In HQ you can walk around your soldier’s base camp, collect challenges, test weapons on the gun range, or even try out Scorestreaks on the beach – you can now experience all the Scorestreaks by testing them against NPCs, to help you decide which you prefer to take into battle with you – all while waiting for the match to load. Then there’s the 1-v-1 range, where you can challenge opponents to a quick combat session. There’s a lot of scope in HQ, it fully takes the match lobby into a new dimension and it’s full of nice little touches, like a glowing emblem above a player’s head when he has prestiged, which is now a shared event to celebrate. When you first jump into MP, you’ll be tasked with choosing a division, which is a creative way of presenting classes. You now have a Rank for each division, just as you do with your weapons, so there’s more leveling up to do be done with each match. 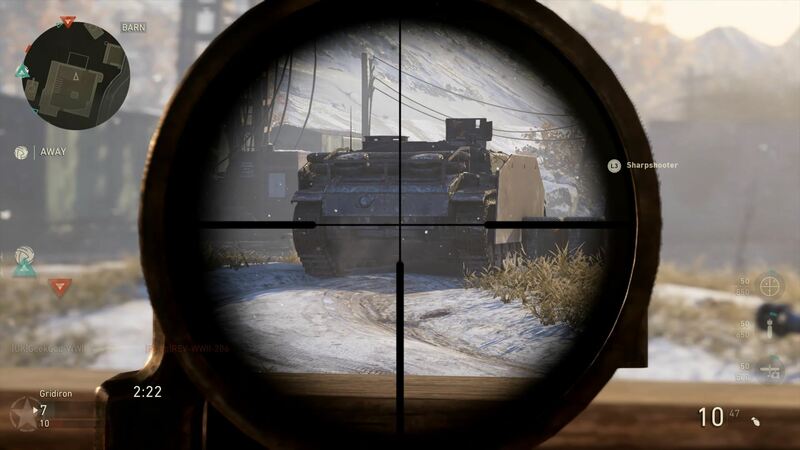 The options are Infantry, Airborne, Armored, Mountain, and Expeditionary, which specialise in Rifles, SMGs, LMGs, Snipers and Shotguns respectively. Despite the stripped back feeling, it still manages to contain all the features we’ve come to know and love, but has dealt with the feature-creep of past iterations. The futuristic combat is no more, replaced by semi-automatic rifles and full-length shotguns. You’ll get a single primary weapon with two attachments and a secondary with one attachment by default, which can be bumped up slightly with training. You’ll also start with one grenade, which also gets increased as you rank up. The amount of weapons available has been stripped down, too. Four snipers, four shotguns, four light machine guns, and only a few more rifles and SMGs. Perks are gone, Basic Training badges take their place, which are essentially packs of perks bundled together for certain play styles. They reflect the divisions really well. It’s back to basics, as well as boots on the ground. All of this has the desired effect of slowing down combat without tweaking the time-to-kill. The stand-out weapons are definitely the flamethrower (a map specific special weapon) and the incendiary shotgun, which causes complete destruction, yet isn’t overpowered. The shotgun will soon become a fan favourite, much like the n00b tube of the Modern Warfare era. They’ve managed to balance it out quite nicely though, by limiting you to only four incendiary shells, so use them wisely. Range has a big impact on these rounds too, as with any shotgun. Character customisation makes a return, with a good variety of ethnic backgrounds for both men and women. You can’t wear bright and crazy coloured outfits this time around, as this is WWII after all, but you can unlock special helmets if you really feel the need to stand out among the sea of soldiers. And while you can’t get crazy on your character, you can still select animated calling cards and customise your emblem with the familiar emblem design tool. While this is essentially an entertainment package, it’s also a commemorative piece dedicated to our servicemen, and this quote from the credits puts it so succinctly “This game is dedicated to the men and woman who served and sacrificed in service of their countries during World War II”. I could write an entire article talking about the new game modes introduced in WWII, including Gridiron, which amounts to a redesign of Uplink for a game with boots stuck firmly to the ground, but the pièce de résistance is clearly War Mode. This is a three-phased objective mode, with a strong emphasis on teamwork. War is as far from your typical Team Deathmath style gameplay as Call of Duty could possibly be, so it’s a refreshing change and a welcomed introduction. As allied forces you’re fighting a besieged Nazi occupation, by pushing them back one objective at a time. It’s slower paced, it’s grittier, and it’s the cherry on the cake of this World War II experience. Of course it goes without saying that the return of Nazi Zombies as a game mode will excite fans to no end. 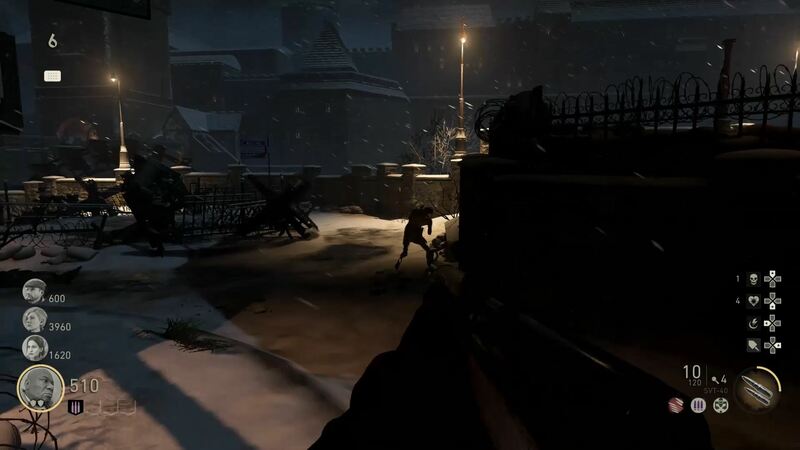 Zombies is deeper this year than ever before, with a re-imagining of the class based system broken down to DPS, Crowd Control, Tank and Healer, and again with the stripped-down environment making it darker, creepier and less fluorescent than last year to put the mood just right to take us back where this game mode began: Nazi Zombies. Call of Duty: World War II is everything I wanted it to be. It’s Call of Duty pre-Modern Warfare 2, but with the contemporary gameplay mechanics we’ve become accustomed to. There’s character progression, customisation and unlocks, while also maintaining boots-on-the-ground, robust combat and limited weaponry. A spectacular release that has a strong chance of becoming a fan favourite as one of the best Call of Duty releases in years. A spectacular release that has a strong chance of becoming a fan favourite as one of the best Call of Duty releases in years.